North-Sportif products recalled due to drawstring strangulation risks. Washington, DC (www.NewYorkInjuryNews.com) – The U.S. Consumer Product Safety Commission, (CPSC) http://cpsc.gov, along with North-Sportif Inc., of New York, NY, announced a recall of North-Sportif hooded jackets and reversible jackets on March 31, 2010, as reported by the CPSC. The organizations report that consumers should stop using the recalled products immediately unless otherwise instructed. 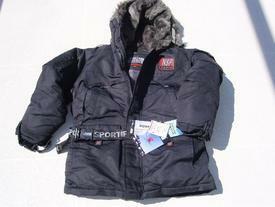 Approximately 360 jackets and 360 vests are being recalled. They were manufactured in China and sold in Burlington Coat Factory stores nationwide from October 2002 to January 2010. They retailed at approximately $13. While no injuries have been reported, the jackets have a drawstring through the hood and the vests have a drawstring through the waist, which could pose a strangulation and entanglement hazard to those wearing them. In February 1996, the CPSC stated guidelines to prevent children from strangling or becoming entangled in upper garments. The industry voluntary incorporated the guidelines into production standards in 1997. Consumers are advised to immediately remove the drawstrings from the garment to eliminate the hazard or to return the piece of clothing to Burlington Coat Factory for a refund or credit. Consumers can also contact North-Sportif at (212)643-9730 between 9 a.m. and 5 p.m. ET Monday through Friday. Questions can also be directed to the store’s website, www.burlingtoncoatfactory.com.